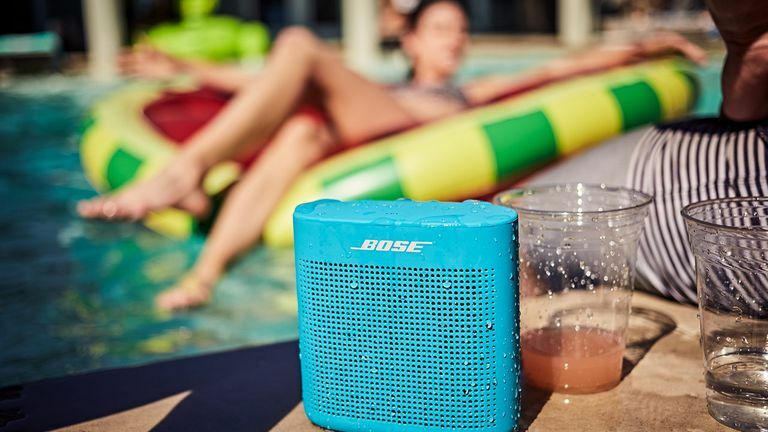 Whether it’s a new speaker out of the box or you needed to reset it, you can quickly connect a Bose Soundlink Bluetooth speaker to your iPhone or Android device. Nearly all the Bose Soundlink speakers use a similar pairing method through a dedicated Bluetooth button on the portable speakers. With a brand new Soundlink speaker, out-of-the-box, start by plugging it into the wall using a wall charger. These instructions will also work to pair your Soundlink Revolve, Color, Color II, Mini, Mini II, or other Bose Bluetooth speakers. Bose uses the same buttons across all its Bluetooth speakers. The shape or layout of the buttons may vary from device to device, but all should have the same ones. Press the power button. If the power light is red, it needs charging; if it's orange the battery is half full; green means the battery is full. The Bluetooth speaker should go into connecting mode when turned on for the first time. If you need to change the language, use the Plus (+) and Minus (-) buttons to scroll through the options. On iOS: Go to Settings > Bluetooth and tap the Bluetooth toggle to enable it. On Android: Go to Settings > Connected devices > Connection preferences > Bluetooth, then enable Bluetooth. Tap Pair New Device. Tap the Bluetooth device called "Bose Soundlink." The Bluetooth light on the speaker will blink blue when it's ready to connect. It will blink white when it's in the process of connecting, and will appear a solid white when it's connected to a device. Locate, then press and hold the Bluetooth button on top of the speaker until the indicator light blinks blue. The speaker is now in pairing mode. Tap the Bose Soundlink device to connect to it.